It’s that time of year again, the time of year to go out and stock up on winter clothing, time to start stockpiling firewood. It’s time to prepare for the cold winter months. Well, that is if you’re not in Hawai’i. Here in Hawai’i this winter is going to be harsh and everyone is gearing up for it. People are stockpiling up sunscreen and beach towels. 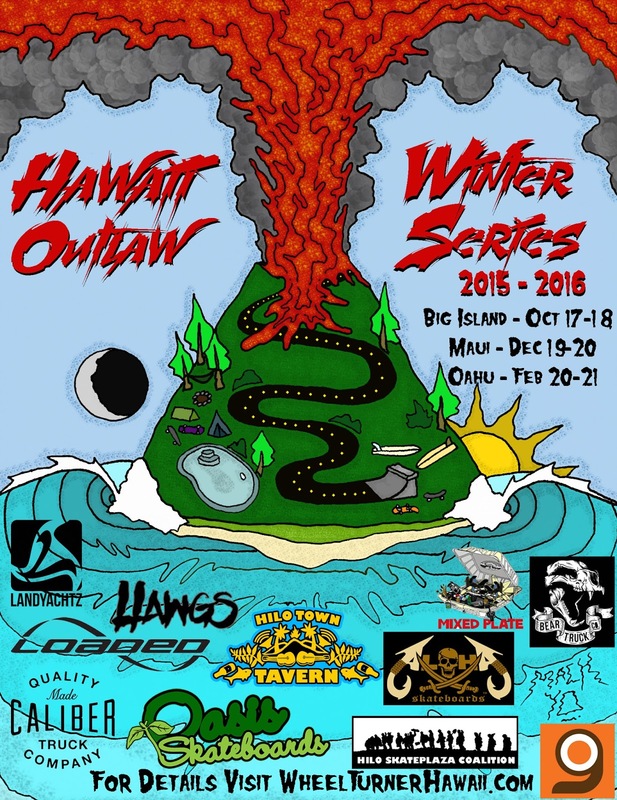 Not only are people gearing up to hit the beach but Hawaii’s downhill warriors are gearing up for another awesome Hawai’i Winter Outlaw Series. With the series continuing for the 7th consecutive season, this winter is definitely going to be gnarly. This year the HWOS will continue with the same format held in the 2014-2015 series. There will be one event on each: Hawai’i Island, Maui and Oahu. The 2015-2016 Series will be kicking off this month on Big Island, October 17-18. In December the event will continue on Maui, December 19-20. The series will wrap up with a killer event in February on Oahu, February 20-21. This year we are continuing with the same format so that every one will have an equal chance of winning the crown, the King of HWOS. The crown has been held for two consecutive seasons by Maui’s Dakota Camp. Will this be the year that we see the king dethroned? For our series opener race on the Big Island be prepared for a Fast draft battle with about 1 1/2 miles of racing with a few mellow turns. This race will be going off October 17-18, that’s coming up soon so get those trip plans dialed in. Last year we were contested by a hurricane, and sure enough it rained extremely hard on race day. Luckily with the rain alternate day we found blue skies and dry roads. We’ve had a very active el nino season so far, so pray for good weather. For the day of the race, October 17, we will be meeting at Mauna Kea Recreation Area no later then 9:00 A.M. There are bathrooms at this pit stop, along with a choice parking lot, some picnic benches, pine trees and an AMAZING view. Here we will have the riders meeting and we will be departing for the hill at 10:00 A.M. Don’t be late! If the weather is bad on race day we will relocate to the other side of the island in hopes of staying in the dry. If the weather is bad all over we will wait til the following day to host the race. If the weather continues to stay wet all over I have a great location we can race in the rain. Accomodations for all you breddehs. So get excited, get pumped, this year the HWOS is going to be of epic proportions. Expect the racing to be tighter and faster and the competition to be fierce. Get those trips planned and we will see YOU on the Big Island for the HWOS opening event on October 17-18. And don’t forget to keep your eyes focused on the WheelTurnerHawaii page for any additional updates and information. Thank you for sharing this write my essay for me cheap publish. The content is honestly very helpful. This blog is always sharing useful facts. keep sharing greater facts and posts. I truly loved the way you wrote this post. It has some right facts that are written in an easy to recognize manner.